Chicken Tortilla Soup is simple to make and will warm you up on a chilly winter night. It has been cold here in my part of the world this year. Well, it actually gets cold then it warms to 70 then it gets below freezing the next day so we all are just trying to survive not getting a cold. 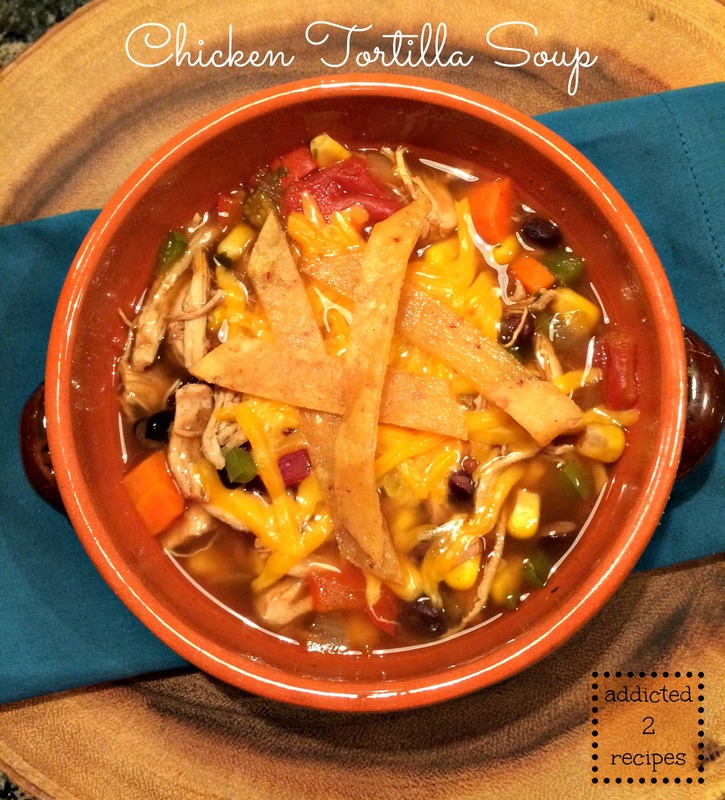 This Chicken Tortilla Soup is perfect for chilly weather. When I saw that we were expecting snow, I hooted and threw my fists up in the air like I just don’t care. I seriously was like a kid that got the message we had a snow day. I had visions of my eating this soup throughout the day, dressed in my flannel pj’s watching Andy Griffith reruns all day long. Only it didn’t happen. Oh we got snow. They just didn’t cancel work. So as it was snowing the night before my big wishful thinking day off, I threw a bunch of ingredients together, yes this is a lot of ingredients, and made chicken tortilla soup. And it turned out great. A wonderful way to stay warm on a cold day. It’s not a creamy base so it is healthy for you. I took it into work so we could all share in the warmth and not have to drive anywhere on the slick roads. It was met with a round of success by my co-workers. If you want it a bit more heat, I would suggest using Rotel tomatoes. As we’ve determined here, I’m a wimp for spicy foods so this was the perfect spiciness for me. In a soup pot, add enough water to cover the three chicken breasts. Add chicken breasts to the water and bring to a boil. Reduce heat and simmer for 20 minutes. Drain and shred chicken. In a large soup pot, add chicken stock and beef stock, green and red pepper, onions, carrots, corn, black beans and tomatoes. Mix together. Season with cumin, oregano, chili powder, onion powder, garlic powder, salt and pepper. Add shredded chicken and stir together. Let simmer for about 15-20 minutes. Fry some corn tortillas by placing a small amount of olive oil in a skillet and heating over medium heat. Cook corn tortillas one at a time until crispy, turning over once. Drain on a paper towel, then cut into strips. Serve with shredded cheese and corn tortillas. You can also serve with avocado, sour cream, corn chips, and salsa.